Maya's ear infection started a few weeks ago. I treated it by some ACV and Mal-A-Ket wipes daily and it seems to have gotten better. 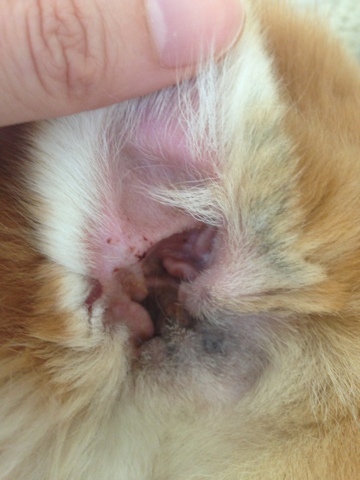 Maybe because water went in her ears while I gave her a bath, or because I started to slack off with wiping, Last week I found her ear looking much worse and goes much deeper than I can reach. After some debate, I finally decided to take her to the vet just to make sure there's no foxtail stuck in her ear. He then decided to shave off some of Maya's fur around her ear and clean it with a q-tip. Maya got wiggly when the electronic shaver reached her ear and I was no longer able to hold her still. A vet tech came to help, and after the first round of holding her snout, she got a bit mouthy. They don't want to risk it, so a muzzle went on. 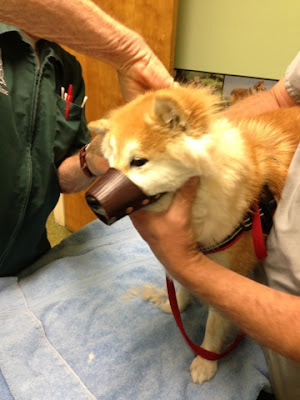 It was kind of sad to see them put the muzzle on her, and I was really worried this would turn into THAT visit which makes her hate the vet from now on. Luckily, she was back to her happy self once the muzzle was off, especially with all the treats shoving in her mouth. I went home with a $80 receipt and a small bottle of Panalog Ointment. Two days later, her ear seems to be back to normal. I guess if I continued with the Mal-A-Ket wipes, I would probably have the same result. Instead, Maya now has a ear that looks much bigger than the other, because the doctor shaved all the hair off around the base. Ah, the price we pay for the peace of mind. OMG, how do you even deal with the adorableness of that excited TAIL? And yay for two-digit vet bills!